Features built-in expression pedal and 40 artist presets. The RP300A combines the tones of 12 of the best in vintage and modern Amps with 26 fully programmable, studio quality effects (up to 12 at once). The built-in expression pedal can be assigned to control your choice of parameters in real time. Each effect includes up to 5 adjustable parameters providing the flexibility to create the exact sound you're looking for. The 6 character alphanumeric and 2 character numeric displays combined with the 5 knob-matrix editing system provide a simple, straightforward user interface. The built in Drum Machine is a great tool for improving your timing with your choice of 30 different patterns with adjustable tempo and volume level. A chromatic tuner lets you quickly check or tune your instrument to one of 4 different tuning references. 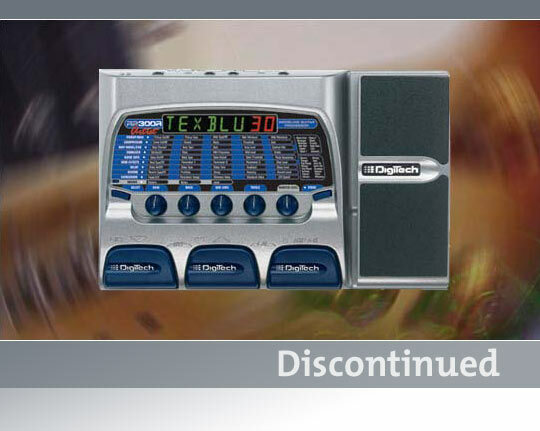 The RP300A also includes DigiTech's Learn-A-Lick feature which samples a phrase from your favorite tape or CD, and slows the playback to 1/4 of the original speed without changing pitch, allowing you to learn solos note for note. The RP300A comes ready to use with 40 great Artist Presets, and includes 40 User Presets for custom creations. The rear panel features a single 1/4" input, 1/4" left and right outputs, 1/8" stereo headphone output for late night rehearsal, and an 1/8" stereo Jam-A-Long/Learn-A-Lick input. The Expression pedal does not seem to respond correctly on my RP300. Is there something wrong? The first thing to try is a pedal calibration. Start with the unit off. 2) Press and hold the UP Footswitch while reconnecting the power. 3) Continue to hold the UP Footswitch until the Display reads TOE DN. 4) Rock the Expression Pedal forward to the toe down position. 5) Press either footswitch and the Display now shows TOE UP. 6) Rock the Expression Pedal back to the toe up position. 7) Press either Footswitch. The RP300 will return to the last selected Preset and the Expression Pedal is now Calibrated. Can I have two clean sounds in the same patch with one on channel A being totally clean and the other on channel B having tremolo? Also, can I have "Clean" on channel A and "Boogie" on channel B? You cannot have two different sets of effects on the different channels. Nor can you have two different amp models on the different channels. The channel switch is used for jumping from one amp gain setting to another within the same patch. This is usually used to change from clean to dirty or vice versa. The best way to achieve what you're trying to do is by using two or more separate patches. What is the reset and pedal calibration for the RP300? Put the expression pedal in the 1/2 way position. Press and hold the Select button. The display should say Reset. When the display reads Toe DN, put the expression pedal down like stepping on the gas pedal of a car. Press and release either the Up or the Down footswtch. Press/release one of the Up/Down footswitches. Put toe down on pedal and put pressure on toe until display reads DONE. Press Up or Down footswitch. Unit will go back to program mode. How do I relocate a preset? Dial up the desired preset. Use Up/Down footswitches to go to the new location. The preset is now relocated.